Recipes that can be transformed from one dish into another and that hold up well as leftovers are really appealing to my schedule. I usually leave home early in the morning and don’t return until after dark, sometimes toting along more work. So, recipes like these which make for a quick and easy weeknight meal using a combination of fresh and prepared ingredients are lifesavers. On Wednesday night, I stopped into Russo’s on 7th Avenue and picked up a loaf of fresh bread, crunchy on the outside and soft on the inside, a package of whole wheat linguine, a jar of spicy marinara sauce, one bunch of fresh basil and a wedge of pecorino romano. I added in a few ingredients waiting in my kitchen to be used – one bunch of mint, a handful of pine nuts and a few dried red chili peppers. The result was a spicy pesto sauce which yielded 3 dishes – a hearty dinner, a quick snack and a savory breakfast. Thus, Spicy Pesto 3 Ways. 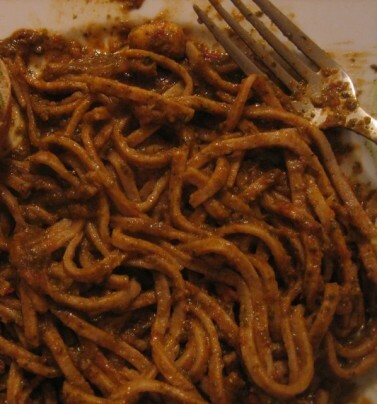 Here’s the first: Whole Wheat Pasta with Spicy Pesto Marinara. Stay tuned for the other two. I made this pesto using mint in part because I’ve become convinced that anything green can be made into pesto (basil, cilantro, mint, etc.) and because the mint in my fridge was threatening to go bad. It gave a really nice pop to the pesto that lingered in my mouth and balanced the spice of the red chilis and creaminess of the basil. 1. Add the pieces of pecorino romano to food processor and process until in small pieces. 2. Add the pine nuts, red chilis and garlic and process until all are in small small pieces. 3. Wash the basil and mint. Dry the leaves with a paper towel or by wringing the water out. Add the basil-mint mix to the food processor bowl. Not all of the basil-mint mix may fit into your food processor bowl. In that case, add the basil-mint in batches and process. 4. While the food processor runs, slowly drizzle in the olive oil through the top opening or add before running. If all of the basil-mint mix didn’t fit, add the remaining amount and run the processor again while drizzling in the remaining olive oil. 5. Transfer from the food processor to a bowl. Add salt to taste. Refrigerate until ready to use. *For a milder garlic flavor, you can blanche the garlic pieces before using. Put the peeled garlic cloves in a saucepan with cold water and bring to a boil. Drain and then use as you would otherwise. Making Pesto Marinara: Now that you’ve made the pesto, all of the work is done (although it goes so quickly that it hardly feels like work). Heat the jar of marinara in a sauce pan on medium-low. Add about one and a half cups of the pesto and mix in. I like to keep a nice balance between the pesto and marinara, so I know I’ve reached the right level when the sauce has a red-green look to it. Enjoy over wide noodles, like the whole wheat linguine we had, or penne or rigatoni. I would avoid angel hair pasta since the pesto tends to overpower thin, delicate noodles. Suggested additions: A few handfuls of tuscan white beans would have gone nicely with this pasta with the added benefit of providing a dose or protein. 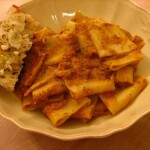 Another spicy pasta dish you might enjoy is Roasted Tomato Vindaloo Sauce. I love a good pesto and I agree anything green can be pesto goodness. Nithya: Jeff,the only thing I haven’t turned into pesto is parsley. I know it would work but for some reason I hate the taste of parsley. coincidentally, i made something very similar last night! i was making a spicy tomato sauce and decided to dump in some leftover spinach/almond pesto i had made before. a and i were both pleasantly surprised with how yummy it turned out topped on wheat penne. 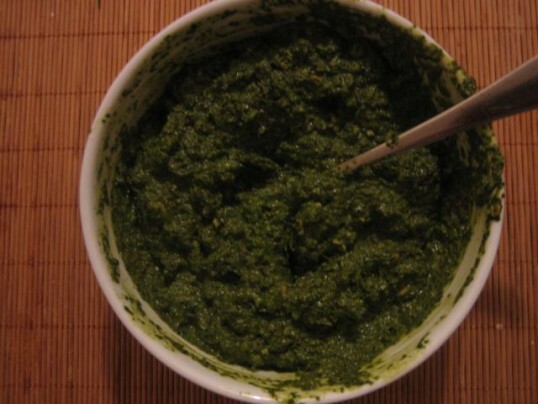 Nithya: Trupti, and there you have my second way of finishing up some of our leftover pesto! I loved this bruschetta…very tasty and anice departure from regular bruschetta. I’ll have to try out your method next time of mixing it with onions and tomatoes. I use parsley on a regular basis when I make pesto. I use equal quantities of basil and parsley and usually make it 6 cups finished product at a time. I like the parsley for the additional nutritional kick it adds to the pesto. Hello to every one, since I am in fact keen of reading this website’s post to be updated daily.